In today’s atmosphere, and entered the era of globalization in our country, it would be important if we take our eyes for a moment to areas that have potential for Indonesia tourism. Islands such as Kai island, Turtle island, Takabonerate island, Bunaken island to island in Papua, Raja Ampat has great potential to become an object of tourism. To introduce more about Ohoiew island that has a wonderful potential of tourism to the international community, and also intends to introduce the island through our activity ORARI IOTA – Ohoiew Island DXPedition 2012. Ohoiew Island DXPedition 2012 is expected later that the island will be better known by foreign tourists through amateur radio. 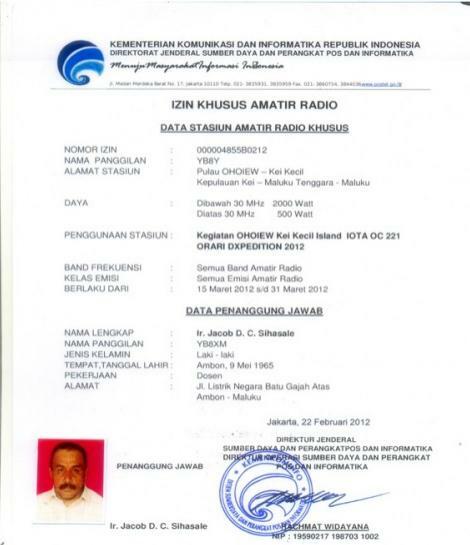 And will be a friendship between amateur radio through the exchange of QSL cards , so Kai Island will be better known. QSL for YB8Y via YB1GJS – Direct or QSL Buro. The Unitary state of the Indonesian Republic (NKRI) is accurate name describing an island country. NKRI consists of thousand islands, tribes, languages and cultures. Ohoieuw island is a very small island which is located on Minor Kei Islands, Southeast Moluccas, and this island belongs to two villages: Ngilngof and Namar. This paper will describe two things. Firstly, this paper will focus on some features of Ngilngof village and afterwards it will deal with several features of this island. This village is located at the northwest coast of Minor Kei island. There are two interesting aspects of the village. Firstly, this village is precisely located at the coastal area of northwestern part of Minor Kei island. Its topography comprises sand at the beach, following the red soil which is overgrown with grass, shrub or coconut trees, then the black soil which is used as garden by local people. In the 1950’s there were a lot of trophical rainforests, but now there is no more rainforest at the surrounding area due to the inhabitants’ deforestation. Secondly, the local inhabitants are Austronesians who migrated to this island thousand years ago. On the 2010 they were around 1118 people. Migration wave came from two directions, namely: from the south and the north part of the island. The first wave had moved from Banda island, even from Bali island, via Leti island, Kisar island and Luan island and arrived at Kei island some hundred years ago; the second one had moved from Ternate island and Tidore island, via Seram island, Goram island, Teor island and Toyando island and then came to Kei islands in almost the same time. All of them were the Austronesian speakers and the bearers of Austronesian culture. Ngilngof has a number of tourist objects which has been visited by domestic and foreign tourists. The first and foremost one is Ngurbloat beach which presented by Muller (The Moluccas, Singapore: Periplus Editions, 1991: 128-131) as the finest beach of the world, and it is nearly 5 km long. Beside that beach, there are two other beaches, i.e, the beach of Ngilngof village itself and the Yanroa beach which is reached in 5 minutes by foot. The second one is the Abel lake which is situated at the southeast of the village.There is no effort or plan to provide facilities for recreation or tourist purposes, for instance: to build swimming pool or fishing pond. The third object is two mountains or better said two hills: Kilyeuw and Kilmanut. These two hills are the highest points of the Kei island, except another hill called Masbait nearby to Gelanit village. They are very suitable for hiking. The fourth object is Hoat and Ded Te Idar. The Hoat is a bay located at the southeast part of the village. This bay can be used as a swimming area for those who want to swim. The Ded Te Idar is an underground path which is a very interesting place for those who want to look for an exciting object, particularly those who are collecting folklore. The last one is traditional art such drumming and dancing performance. As mentioned before that the Ohoiew island is a small coral island situated at the western part of the village. This is one of ten islands group at the western coastal area of the Minor Kei islands. Other islands are Ohoiwa, Ohoitir, Nukahai, Nai, Hoat, Lea, Amuut, Nuhura and Tangwain. This island, in the past, was a dwelling place as its name indicated: ohoi is a hamlet or a village and ew is unknown, at least for the author. More than hundred years ago the inhabitants left this island and moved to Ngilngof village and elsewhere. There is a legend as to how the islands have been divided among the the western coastal inhabitants of Minor Kei. From the unknown time, there was a canoe race for two old women. The winner of the race would possess these islands. The first women had reached the Ohoieuw island, while the second one was still at the shore of mainland (Minor Kei). The latter did not come out as the winner of the race. Then she thought that it was easy to claim the rest islands as her possessions just by shouting, so she did it. The rest islands, therefore, became her and her descendant property. The first old woman was believed as ancestor of the village Namar and Ngilngof’s people, while the second one was the ancestor of village Debut and Dian’s inhabitants. With regard to village’s property, there are more three small coral islands which belong to Ngilngof village, i.e Ngaf island, Ngodan island and Er island. These islands are not too far from Ohoiew island, at the northern part of Ohoiew island. These islands could be developed as tourist objects in the coming years. Ohoiew as an atoll does not have enough fertile soil. On the ground people grow coconut trees, but they do not really care it due to the prize fluctuation of copra in the last few decades. Further, there are other vegetation as grass and trees. The mangrove can be found at some places of the eastern and western part of this island. In the surrounding sea people can find reefs and various kinds and sizes of fishes, shell-fishes, lobsters, cucumbers, even pearl-shells. They can be recommended as Eco-tourism objects for those who are going to enjoy diving and fishing. Local people used to catch fish by trapping, by poisoning, or by using nets or nylon line. They used to collect crabs and shell-fishes for their own consumption or even for selling. In the last few years, people paid more attention to grow seaweed which became a prospective commodity. As usual, there are various kinds of birds as kingfishers, seagulls. It is worth to mention that there is a kind of land-crab, called kartuhan (indigenous name). This animal used to eat coconut flesh, and of course very fat but delicious. Climate of the island is a tropical one and it can be divided into two seasons: dry season and wet season. In short, the dry season begins from April to October and the wet season starts from December to March. There is usually a calm period from the beginning of October to the beginning of December. For those who are going to enjoy underwater scene, from October to December is a favorable time. The Ohoiew island could also be recommended as a tourist object due to the following reasons. Firstly, this island is uninhabited, so that tourists can enjoy their freedom without any human disturbance. Secondly, sandy beach and clear seawater will provide a refreshing environment for those who are looking for solitude and for swimming or diving. Finally, there is also possible to communicate with the outside world by mobile phone. The distance between this atoll from the village is not far. It takes only 10 minutes by longboat or speedboat. For those who want to visit this island, they can get on ships or airplanes to Tual and Langgur, and then take a taxi or a bus to the village Ngilngof.